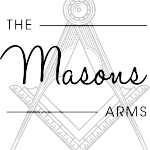 Welcome to The Masons Arms - we can't wait to invite you in. Spending time outside at Masons Arms is a joy in itself! We have plenty of outdoor seating, with cosy heated sheds if the weather isn't too great - to benches and tables surrounded by beautiful flowers and plants.